Arthritis injection therapies provide a safe and non-invasive alternative to surgery. Seeing a doctor is always the recommended step with any prolonged shoulder pain. At Pain Clinic NYC, located in Queens, NY, we are dedicated to treat to source of the pain, not just the symptoms. With a proper and prompt diagnosis, the treatment of the affected area will typically allow most patients to resume normal activities and return to work in a relatively short period of time. The shoulder is a ball and socket joint with a large range of movement. Such a mobile joint tends to be more susceptible to injury. Shoulder pain can stem from one or more of the following causes. The shoulder is designed to be flexible and to move in many different directions in order to allow your arm to successfully complete the numerous tasks you undertake during the day. However, this very flexibility means that it is prone to a number of injuries. For instance, the shoulder can become inflamed, a condition known as shoulder tendinitis that often occurs in people who engage in repetitive activity (for instance, playing tennis, swimming, etc.). Pinched nerves can also cause pain to radiate through the shoulder and even down through the arm and hand. More acute injuries include dislocation or breaking of the shoulder. Sometimes, the joint is too loose, leading to shoulder joint instability that can leave a sufferer prone to dislocations and arthritis. There is a wide variety of symptoms in addition to pain that can indicate a problem with your shoulder. For instance, difficulty using the shoulder, a limited range of motion, and a popping or grinding noise can all indicate a problem you should have checked out by a doctor. You should also consult a doctor if you experience any severe pain in your shoulder, especially if your pain is interfering with your sleep. Many of the same tests used to diagnose neck pain are also used to diagnose the cause of shoulder pain. For instance, X-rays, MRIs, myelograms, and electrodiagnostic studies can all be used to study the bones, tissues, and nerves that may be damaged and causing you pain. 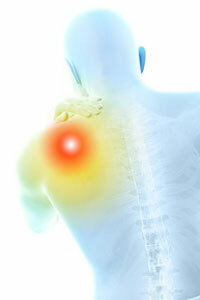 The first step in handling any type of shoulder pain or injury is to consult a doctor. At Pain Clinic NYC, our doctors have been trained in shoulder problems and can, therefore, provide an expert assessment of any shoulder issue you are experiencing. Not only do they have the expertise to handle whatever condition you are experiencing, but they also possess the compassion and empathy that allow them to understand what you are suffering. In consultation with you, they will determine the exact cause of your pain and provide a treatment plan customized to your individual situation.